Hello there! This story was written back in August, but I only got around to illustrating it on Thursday. There is a cameo from our Schnauzer friends Dex and Lou, Pip being clever, a cameo from myself... and a bull in a china shop. This was it. Pip’s first day on the job. She had been waiting for this moment for almost a year, since she arrived as a six-week-old puppy. Since then, she’d made many friends, Ben and Jack, Fly and even newcomer Teddy. But today wasn’t about them, today was about her. Pip’s first day on the job. She didn’t include Sheila in her friends list, because she wasn’t really a friend, more of a teacher. Or a mentor. Although some of the things that Sheila got up to, Pip instinctively knew not to copy – not coming back when called for was one of them. But Sheila’s stock working skills were almost as good as Fly’s, and since Fly was getting on a bit; it was up to Sheila to show Pip the ropes. She really hoped it was going to go smoothly. Sheila arrived in the barn shortly after nine that morning. So much for her saying it wasn’t a nine-to-five job. Pip snapped out of her singing daydreams when Sheila spoke up. Sheila at least had the courtesy to appear worried. “Well, yes. But you’ll have my help. And Ruth’s. I’m sure we can manage.” Sheila knew that Pip was scared of traffic, but she decided not to bring the subject up. She could see that Pip was trembling a little, but Pip quickly composed herself and followed Sheila out of the barn. The Land Rover was waiting patiently next to the farmhouse. It was Sheila’s favourite mode of transport. She always rode on the middle seat, while Pip was on the passenger seat. It was a carefully planned system, and Sheila always liked to be in charge of the system. Ruth arrived out of the house and climbed into the large boot, while her dad took the driver’s seat away from Sheila. The town was more of a village really. It was so small that everyone knew each other by name. There was no rush hour, because no one was ever in much of a rush. There were a few shops among the houses. A supermarket, a shoe shop, a charity shop, and no less than two antique shops. A bit over the top, thought Pip, as she peered out of the Land Rover’s passenger window. The herd quietly walked through the gate and onto the road. There were around twenty of them, and one was a bull. He was an elderly bull, and he went by the name of Eugene. Not that Pip had met him, but she had heard a lot about him. The china-loving bull. He also had the reputation of a cunning fox. Every time he was herded through the town, he would try to make a break for it, usually to one of the antique shops. As far as Pip was aware, he had never actually made to a shop. She was determined to keep it that way, so she kept a close eye on him. Much to Sheila’s and Pip’s surprise, the walk through the village went without a single cow breaking away. Thankfully for Pip, it was a nice, sleepy morning, so there were very few moving cars, and when one came along, Sheila subtly got in-between Pip and the offending car. Though it wasn’t subtle enough for Pip not to notice, and she was silently grateful. The convoy of cows, dogs and people made it to the new field without a single hoof out of place. Pip thought later that she was stupid to think that the cows weren’t up to something. But for now, all was well and good. The humans tied the gate closed because the latch was broken, to be fixed later. The two humans and two dogs walked away, through the town back to the Land Rover. The job was done. Eugene watches the humans and dogs walk away. The fact that the latch was broken hadn’t gone unnoticed by him. He waited until the dogs were out of sight, before he walked over to the gate, and using his colossal strength, broke the string by pushing on the gate. It creaked outwards, onto the road. Being a practised escape artist, Eugene knew to make sure that he closed the gate behind him. The walk to the first antique shop was pretty short. There wasn’t much to look at in the shop window, and Eugene really wasn’t interested in china dolls and plates. He loved to look at china cows. It reminded of his time in the farmhouse as a small sick calf. The family had looked after him well, and it comforted him to be able to see china cows like the ones that used to be on the farmhouse kitchen window sill. The second antique shop that Eugene saw specialised in farming-related antiques, including china cows. Before he stopped to think about it, Eugene pushed the shop door open and went inside. He had never had the nerve to go into one of these shops before, but he had gone in now none-the-less, and so he decided to make the most of it. As he walked through the shop, knocking vases to the floor, he saw all sorts of china cows. Angus cows and calves, bulls, and more. Suddenly, the shop-keeper came from behind the counter carrying a long walking stick. “Get!” he shouted. “Get out of me shop!” he started waving the stick around frantically, making Eugene panic. The massive bull stepped backwards, hitting a shelving unit with his back legs. Thousands of pounds worth of vases toppled to the floor. Trying to correct himself, he turned around to face the angry shop-keeper, still waving his walking stick in the air. Eugene prepared to charge, but fear made him change course. He had never hit anyone, and he wasn’t about to start now. Instead, his head made a connection with a wall of china sheep, which shattered into a million pieces around Eugene’s dazed head. He stumbled to the right, hitting a life-size statue of a horse and sending it crashing to he ground. He swung round and regained his balance. The shop-keeper looked a little scared himself now, but still kept the walking stick carefully positioned between bull and man. Eugene shook his head. He wasn’t thinking straight. Proof of that was that he couldn’t remember the way out. Pip ran blindly along the main road in the village. She had looked around at the last minute and saw Eugene getting out of the field. Restricted by her lead, there was nothing Pip could do but wait until Ruth let go of it so she could jump into the Land Rover. Pip hated to run off, but it was an emergency situation. As soon as she could, she broke free and ran as fast as she could back to the field. She noticed the string on the gate was broken, and that none of the other cows seemed to miss him. Good start, she thought to herself. She made a guess that Eugene would go to an antique shop, because that was what he was famed for. She was trotting along the footpath when she saw a familiar face, and two not-so-familiar ones. “We’re on holiday,” said Dex, as a way of explanation. Pip resisted the urge to roll her eyes this time. “Okay, thank you.” She ran off, only to turn around again. “And have a nice holiday – may I recommend the beach?” And with that, she was gone. Headed towards the antiques shop. Pip cursed herself for not asking which one they were on about. Before she could mull over it any more, she head crashing and banging from the other side of the road. Pip had to adjust her eyes slightly to see inside, and her heat sank. It was Eugene. And he was in a china shop. But to get to him, she was going to have to cross the road all by herself. Her mum had always said that you should wait for a moment and look both ways before crossing. Pip did just that, and swallowing hard, took a few tentative steps onto the road. She told herself not to chicken out now and stop trembling. She made it across the road faster than she thought she would. With that fear partially overcome, she made her way to the bull in the china shop. Eugene thought he was beginning to have a panic attack. His heart threatened to jump out of his chest as he tried to gather his thoughts together. The angry shop-keeper was still waving his walking stick about. “Go on, ye big hunk o’ beef!” he yelled. Then Eugene noticed the door, but he was trapped in a corner with an angry shop-keeper to get past before he could get anywhere near it. He sighed. He was going to need a miracle. Above the man’s shouts, Eugene heard the sound of the bell above the door. Someone was in the shop. 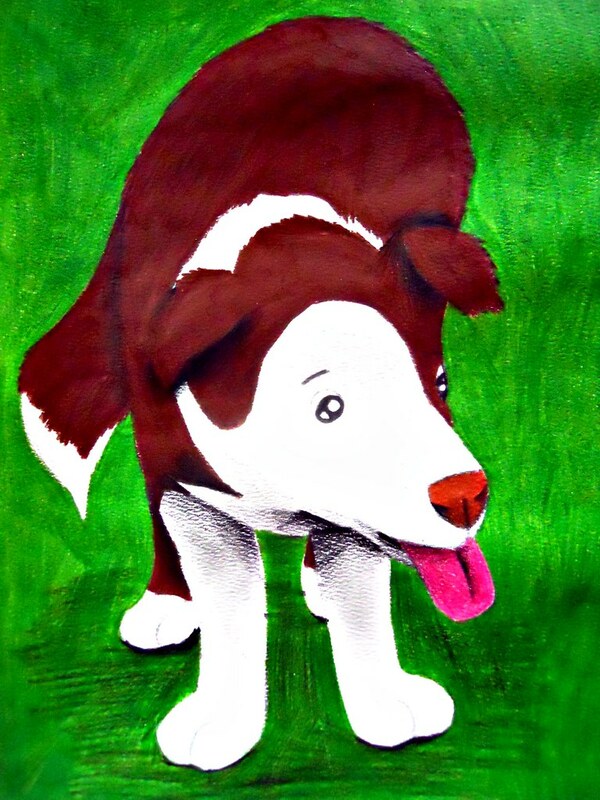 The next thing he knew, a young sheepdog started barking and growling at the shop-keeper. He recognised the dog from somewhere. It looked almost like one of the dogs that were rounding him up earlier this morning. It was a distraction, and he used it. He charged past the man with a walking stick and ran out the open door, down the street, past the three dogs talking on the footpath, stopping to open the gate into his field and carefully shutting it behind him. He decided there and then that he would never go inside a china shop again. Pip was hot on Eugene’s heels as he ran home. She surprised herself at how quickly she could run. She knew that Sheila, Ruth and her dad would be looking for her now. Sure enough, on the end of the street, Ben was being collected, and Pip trotted over, ears down and happy to see them. A medal. Pip had never been happier. Pip's story was inspiring. Thanks so much for sharing! 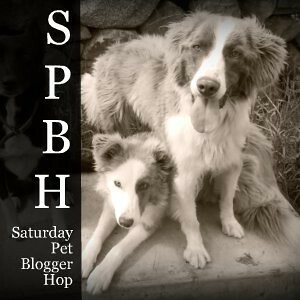 Dropping by on the blog hop today - have a great weekend with your furry friends. Nothing like a good story! Loved it! Pip the sheepdog...has a nice ring to it!